As I continue to explore how to work out loud and grow our employee communities at Walgreens I’m always on the look out to find good books that give me inspiring ideas and stories about how to work better and develop our community strategy. So I thought I’d share a list of books about working better that I’ve enjoyed recently and along with highlights and key takeaways. The Future of Work by Jacob Morgan continues to be a valuable resource for me ever since I read it back in 2014. The structure of the book is based around the five trends of the future of work. Morgan frames the trends as an opportunity and a blueprint to retain top talent, build better leaders and build a strong people-focused organization. He weaves in stories, data, research and case studies from the companies who are leading the future of work evolution. The main theme in Morgan’s book is that if companies don’t acknowledge, embrace and take action on the trends of the future of work they will do so at their own peril. There’s an opportunity cost at stake for those companies who don’t take action on the future of work trends because these trends have a tremendous impact on maintaing a competitive advantage in the marketplace. I’ve used concepts in this book to help our teams, change agents and community champions at Walgreens understand the bottom line impact and business value of what is happening in our employee communities and the value of having a community-focused business model and organizational structure. The stories and data in this book have been helpful in explaining why changing how we work is important to improving the customer experience, because, a company needs a strong internal collaboration and community strategy in order to successfully execute their external customer strategy. As you read The Future of Work I hope you have the same inspiring discoveries and can put the shared knowledge to good use in your organization too. Show Your Work! is the follow up to Austin Kleon’s bestseller Steal Like An Artist. Show Your Work is not a workplace type book, but still, it’s a must for your tool box if you’re a writer, designer or any sort of creative person who wants to learn how to get noticed and grow your craft by proactively and consistently sharing your work. That said, even if you’re in the corporate world you can still take advantage what Kleon says and learn how to share your work to further your career regardless of what you do for a living. I love how the book is designed as it gets to the point and is easy to read in a few settings then you can dip in and out when you want to get some quick inspiration and motivation. I love the truth-packed quotes and the openness of Kleon’s writing style. He gives you a welcomed insight in to his creative process and doesn’t sugarcoat or romanticize the creative process. He gets down to business but does it in a fun and inspiring way. The call to actions that Kleon mixes in are also simple when helps you build momentum and take things one step at a time, which is always a sound way to go when beginning any creative process. As I wrote my three words for 2016 and set the stage for a successfully and productive year, I took to heart what Kleon says about the value of cleaning out our “creative house” and why being a creative hoarder can hold us back from discovering new ideas. So I took a look at my own “creative house” and deleted a bunch of old blog drafts and got rid of other creative baggage that was holding me back. Work Rules! by Laszlo Bock is a great read that takes you inside the mind of Google’s head of people organization. I learned a lot about how Google runs its HR organization and what I love the most about this book is its openness, experimental and adventurous read. It’s inspiring, yet practical and realistic. One of Bock’s goals with the book was to share what he has learned both in his career and during his time at Google. Bock shares details on various experiments he ran at Google to refine communication between managers, leadership and thousands of Googlers. I love the level of details he uses to share the thought process behind emails that were sent, why they made certain decisions to change the hiring process and what he’s learned from succeed and failing as leader and a manager over the years. First, Bock stresses the importance of always making decisions based on data. Many times throughout the book he shows how most decisions made at Google involved some sort of data-based decision. I love this because too often we make communications, culture or business decisions without solid data. With the increasing use of communities and Enterprise Social Networks within companies and our growing understanding of Big Data, I believe leading companies will make it a priority to use the data from their internal networks to make all types of better business decisions and discover future leaders in the ranks. Secondly, I love learning about how Google experimented with “nudging” to improve communication and collaboration among the middle management. Nudging is such an important concept to realize and champion change in a large organization. I’ve used nudging to build communities at Walgreens and it was fascinating to learn how Google did it for their workforce too. No doubt, Work Rules!, is a challenging, provocative and dangerous read. It will force you to think about what’s working and not working at your company. It will make you feel uncomfortable (in a good way.) It will challenge you to think about all the ways you can improve your teams and empower your people. It’s definitely a must read for leaders or those aspiring to lead, especially managers who want to learn how to lead their teams better and get insights into how leaders like Bock think. 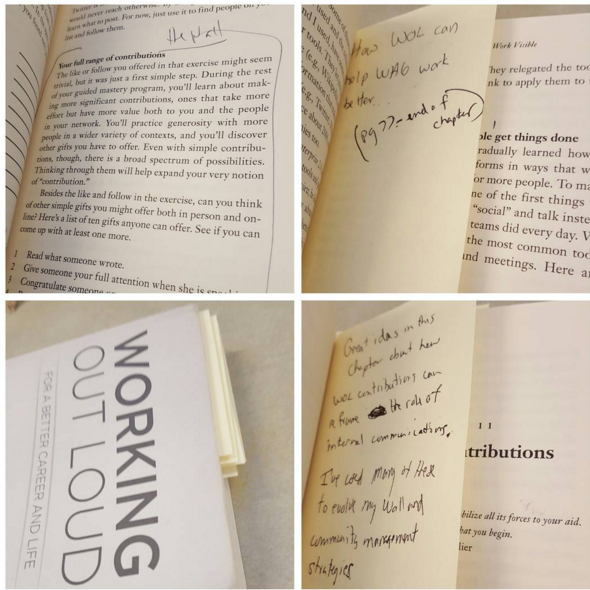 Working Out Loud by John Stepper is a guidebook for how to work out loud to better your career and life. With the workforce constantly changing and job uncertainty a constant reality, it’s an extremely timely book because it gives you an actionable and simple plan to create, build on or discover a new career path. I’ve found that you can read it a couple different ways. One way is to see it as a book to create a career you want by following the steps and starting the working out loud circles that Stepper maps out. The other way is to see it as a stand alone resource for changing how an organization can work better. That said, at Walgreens, I’ve begun to experiment with introducing concepts Stepper presents in his book, such as reframing how we share work knowledge, which is to see working out loud as making contributions and teaching employees a new way of working that’s focused on helping others and the broader organization to solve problems together versus working in silos or only sharing for selfish and self-promotional reasons. Working out loud is a new concept that’s been around for several years but it’s just now starting to take root with the increased use of Enterprise Social Networks within companies. So, when co-workers and leaders at Walgreens ask me what working out loud is and how they should do it and why they should do it and how and why we should use our employee communities to further the concept, I guide them using the understandable framework and examples that Stepper presents. Stepper ends the book with the call to create working out loud circles. To be honest, I’m still figuring out how working out loud circles fit within our employee communities and broader employee work experience. But even though we’re still figuring out how to integrated circles into the our communities strategy, I will tell you that I’ve dog-eared several chapters and pages and shared them with leaders as I explain how working out loud can help us work better at Walgreens. For example, I’ve used working out loud as a way to explain who employees can take an active role in our community and collaboration strategy at Walgreens. I’ve integrated elements into our playbook and how we measure success and progress in our communities. Stepper’s book is filled with honesty and actionable inspiration. Some of my favorite parts are the contributions chapters and the letter that Stepper wrote to himself in which he tells the story behind how his own “ah-a” moment led him on the path to write the book and create the career he encourages us to create. It’s all very inspiring stuff that I’ve taken to heart as I continue to work out loud in my own life and take daily steps and an active role to chart my own career path. 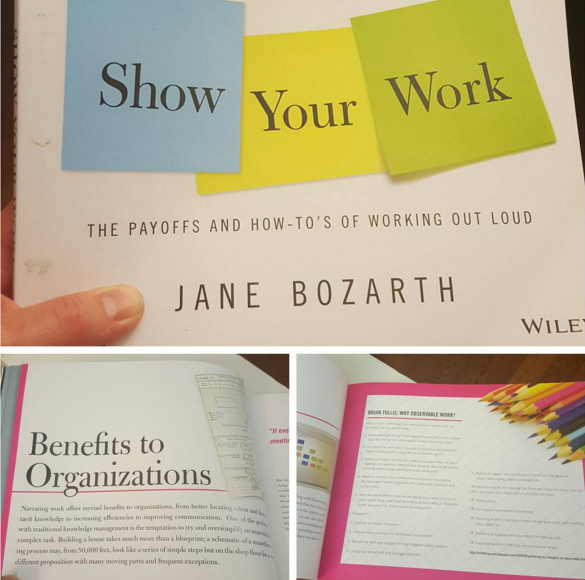 Though it has the same title as Kloen’s, Show Your Work by Jane Bozath takes a different scope on the phrase and explores how organizations can leverage working out loud and sharing your work to improve engagement, share knowledge and break down information barriers across the company. Bozarth is a learning and development pro and it shows throughout the book. The flow of stories and how they’re presented hit on the key pain points that would keep an organization from getting value from teaching their employee to share their work. But Bozarth doesn’t just point out the issues. She provides real and helpful and practical tips and solutions using stories from others who are sharing there work and having success at doing it. I read the book through a few times and I keep it within arms reach on my desk at work. Being a change agent for working out loud and showing work is hard and can be a lonely endeavor, and many times I’ve used Bozarth book to refresh, inspire and reenergize me. I often use the book to quickly show others on my team and our communities advocates why and how to share their work. I love the simple, yet impactful stories Bozarth shares. Its coffee table design makes it easy to dip in and out and grab a thought and then put that thought or insight immediately into action. Like the others book above, this book is a must have for any working out loud champion. I hope you’ve enjoyed this review and I’d like to hear what books are helping you to work out loud and share your work.